Summer Solstice and some beach flies. The wild Sea-run Coastal Cutthroat trout is an aggressive feeder. This June has been one of the better ones for milder, warmer weather, with less rain and wind. We have had some beautiful days of beach fishing through this spring season. And the catching has been quite good too. As usual the Chum Baby fly has counted for many of the Cutthroat trout that we have caught here. With the banner year of Chum salmon fry that we saw this spring, coming out of so many rivers and streams across the region, it is no wonder that the sea-run Cutthroat so readily take this fly. And we have good success with this fly later in the year as well. But by now there are some other prey species of significance to our fishing, and many of them are getting rather big. And so some of our flies should be getting bigger too. Pacific Herring spawn here in the early spring. Rearing in the ell grass beds and shallow near shore zone, they feed chiefly on planktons and they grow rapidly. From juveniles of two to three inches, up to adults well over 8 inches in length, the sea run Cutthroat will feed on these fish year round. Right now they are plentiful, and many of the juveniles are closer to shore still. It is not unusual to catch a Cutthroat with the tail of a partially digested large Herring hanging out of its mouth. This says something for how aggressive these wild trout are at times. Surf Smelt / photo W.D.F.W. 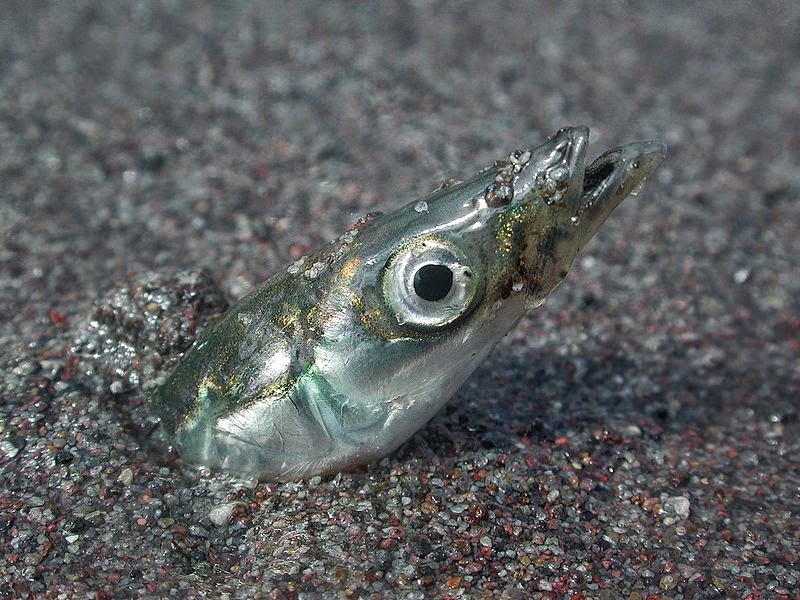 Surf Smelt spawn on many of our sand and gravel beaches here. In fact we have some of the more productive Surf Smelt beaches in the region. Adults may be as much as six to eight inches in length. Our wild sea-run Cutthroat trout, other predatory fish and birds, seals and otters etc., will eat these smelt at every opportunity. Sandlance burrowing / photo N.O.A.A. Sandlance or "Candlefish" are finely slender forage fish, and the trout eat them much of the time. These fish spawn in the very shallowest margins of high tides, in the sand on the beaches. Their eggs incubate beneath the surface of the sand, high and dry, for several weeks before the next monthly high tide cycle returns to set the juveniles free in the waves.We have numerous beaches that host these fish when they spawn. In the days after they have spawned you can find some of them dead on the edges of the high tide line, where they became stranded the night before. They also have a habit if plunging into sandy bottom areas to hide. We can observe sea birds and ducks and trout feeding on these small fish at the same places and times. Remember this the next time that you see the birds holding in the current just off shore, feeding on small fish. Sandlance look like a wet noodle draped in the bird's mouths. Adults can be over 4 inches long. 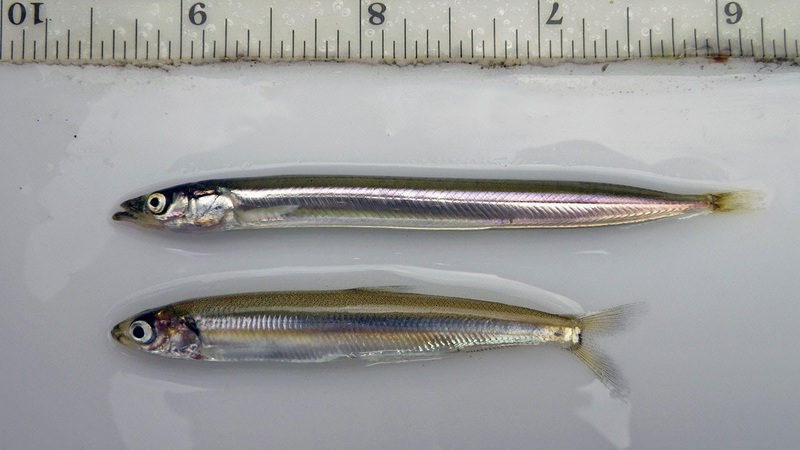 Sandlance and Surf Smelt for comparison / photo U.S.G.S. 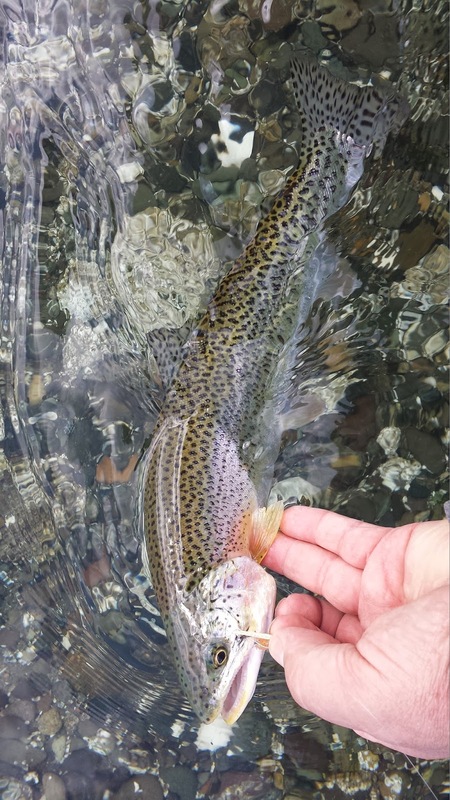 There are many other forage species that sea-run Cutthroat trout feed on all year- Sardines, Sculpin, Stickleback, Lamprey, Marine annelids, crustaceans beetles, ants, termites etc., and so much more. I just shared a few ideas here to get you interested. When you are tying your flies for sea-run Coastal Cutthroat trout fly fishing, once the summer solstice comes along- tie them a little bigger than you did in the spring. It should be obvious that some of the fish that these trout are feeding on are pretty big themselves by now. I tie mine in the 3 to 4 inch range. 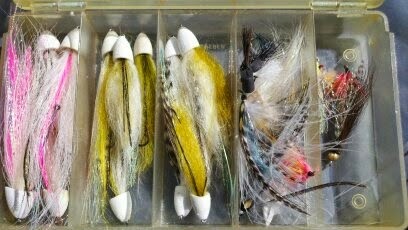 But I always have some smaller flies, some spring-time patterns, and a few much longer. One of my own favorite flies for this fishing, from the Summer Solstice through the autumn, is my "Little Stone's Beach Baby." 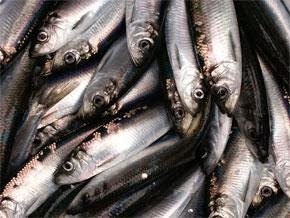 A good general imitation for our Olympic Peninsula and Puget Sound forage fish. 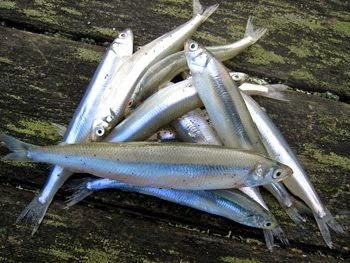 A good general forage fish imitation for Olympic Peninsula and Puget Sound beaches. My good friend Leland Miyawaki always fishes the beaches with his big and bold "Miyawaki Beach Popper," and his fly box proves it! Leland Miyawaki's famous "Miyawaki Beach Poppers"
I would say that the Clouser Minnow, in all of it's bait fish variations around the world, is probably the most ubiquitous of saltwater flies. Here are but some of mine, tied sparse and fine, for sea-run Cutthroat and Salmon fishing on the beaches. One of these flies took the biggest sea-run Cutthroat that I have ever seen here, last September. Tied for Coho salmon and Sea-run Coastal Cutthroat trout. 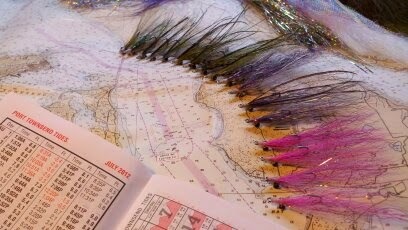 My artist angler friend Jack Devlin ties some beautiful flat wing flies to imitate our Sandlance and other Puget Sound bait fish. This is a tying style that Roderick Haig-Brown talked about in his writings. More recently you would have seen this style featured in Kenney Abrahms book "The Perfect Fish." And the late author and angler Doug Rose wrote about these flies in his blog as well. 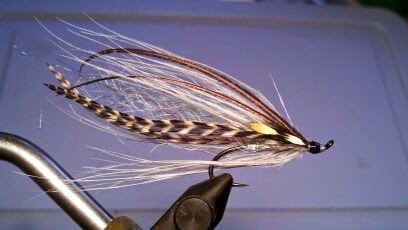 Jack Devlin's beautiful flat wing bait fish flies for sea-run cutthroat fly fishing. The first day of summer is here! And some of the best fishing of the year lies ahead. We will be sea-run Cutthroat fishing through autumn on the Olympic Peninsula beaches. And salmon season is opening here in just over a week. Get those bait fish flies going! I am guiding fly fishers on the Olympic Peninsula beaches, rivers and streams. We walk and wade, fly fishing for sea-run Coastal Cutthroat trout in freshwater and saltwater, and in the rivers for trout and summer steelhead. This is strictly catch and release, traditional fly fishing only. Lunch, snacks, soft beverages, and use of some equipment is included. Personalized and private fly fishing and fly casting instruction, and guided trips are available, to beginners through expert anglers. Public presentations, Naturalist guide, Rowboat Picnics and Tide Pool day trips. Please call, write or email for booking details.